We list the split-second spiels that get stuck in your head. 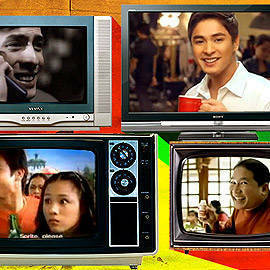 (SPOT.ph) Let’s face it, not all TV ads are created equal. There are some that entertain us for many years, to the point of becoming part of Pinoy pop culture. We picked 10 that have made their mark with their hard-to-forget dialogue. The ad: Resorts World Manila’s "Nothing Compares"
The set-up: Honestly, who can remember anything before "Hres-horts Hworld Mah-nilaaaah"? This now-immortal line is simple, a little strange, a shade eerie, but definitely catchy. Megaworld’s advertisement sounds like a cross between seduction and a disturbed spirit, but the point of the matter is, it’s stuck in our heads-and isn’t that all that matters? In fact, we can barely say Resorts World Manila without resorting to that form of breathy articulation. The one-liner: Say it with us, "Hres-horts Hworld Mah-nilaaaah." RW actually operates under the campaign "Nothing compares," but it’s been temporarily side-stepped by the addictive effects of Hres-horts Hworld Mah-nilaaaah! The ad: Sprite’s "Magpakatotoo Ka"
The set-up: A guy clandestinely watches a cheesy chick flick when his macho friends catch him all teary-eyed. Enter the shot of Sprite, then the words: "Magpakatotoo ka." The campaign was so successful that it became the first in a series of similarly themed advertisments. The one-liner: "Magpakatotoo ka! "-the commercial that launched a thousand careers including Ryan Agoncillo’s (for getting beat up in an elevator) and Toni Gonzaga’s (I love you, Piolo! ), spoofs, and school projects. Sprite’s "Magpakatotoo Ka" campaign is a major coup, giving perhaps the most passe advice in the history of giving advice but with the added bonus of drinking Sprite. Somehow, saying "Be yourself" just isn’t as effective. The set-up: At the peak of his career, Coco Martin moves between sets from drama to action to "Broadway" in search for roles that are "kakaiba," segueing to Nescafe’s caramel-flavored brown coffee that fits his extraordinarily unique taste. He takes a sip and a delicious sigh, before pronouncing, "Yammy!" The one-liner: "Yammy!" Who knew a mispronunciation would lead to a cult following? His inadvertent mistake became such a huge phenomenon that Nescafe launched a second one, spoofing Martin’s twin roles in Minsan Lang Kita Iibigin. The overly rehearsed sequel, however, wasn’t as charming. The ad: PLDT’s "Suportahan Ta Ka"
The set-up: A fresh-faced Christian Vasquez nervously calls up his uptight doctor-father in Iloilo to inform him that he decided to shift from his pre-med course to fine arts. After a long pause, the father’s grim face breaks to a smile and he says, "Suportahan ta ka." The one-liner: Surprisingly, PLDT’s catchphrase for this commercial was "Buti na lang may maaasahan," but it was the dramatic display (and expression) of unconditional love that made a big buzz. The ad: Yakult Philippines’ Okay Ka Ba Tiyan? The set-up: Comedian Gabe Mercado pokes fun at his small frame by being level with other people’s bellies and moving from stomach to stomach, asking jovially, "Okay ka ba tiyan?" The one-liner: "Okay ka ba tiyan?" is a word play on a customary Pinoy greeting and Yakult’s digestive promises. 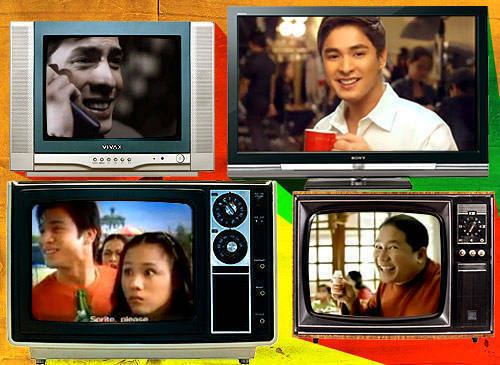 More than a decade after Gabe Mercado’s breakthrough ad, the "Okay ka ba tiyan?" slogan is still used in every local Yakult commercial. The set-up: Set in a no-frills boxing gym, the ad features international boxing referee Carlos Padilla (father of Zsa Zsa Padilla) going through his own training (of sorts). Then he’s shown in his referee get-up while walking around and looking authoritative. Boxers are also working out in the gym. The one-liner: "Basta’t alcohol, Family Rubbing Alcohol. Hindi lang pang-pamilya, pang-isports pa!" The line was used by people to give what seemed like backhanded compliments to jacks of all trades. <>The set-up: It’s a courtroom setting where a man is on the stand being cross-examined. However, the man seems to be suffering from diarrhea so he looks uncomfortable. <>The one-liner: "Mukhang guilty!" The line was uttered by one of the women present in court. It was her rather enthusiastic (yet inaccurate) observation. The line has since mutated as a standard quip of pundits whenever there’s a politician facing legal raps. <>The set-up: It shows a mother, father, and their son enjoying a meal with Datu Puti vinegar. They all make a face when they taste the vinegar. The scene then cuts to a man playing Datu Puti, who once again demonstrates the "mukhasim" look. <>The one-liner: "Mukhasim talaga!" It’s the tagline of the ad. It’s significant because it effectively introduced the mashed-up word to Pinoy pop culture...and made it stick. <>The set-up: It’s got a music-video feel with beautiful girls singing praises for Palmolive soap with beauty cream. <>The one-liner: "I can feel it!" The line was delivered by Alice Dixson with her snappy shoulder move. Actress Shiela Ysrael is also in the ad. Jeric Soriano, son of actor Nestor de Villa and father of director Paul Soriano, directed the ad. <>The set-up: It’s a straightforward ad with Pacquaio delivering this spiel: "You know water is good. But for me there’s something better, you know. Vitwater. I drink it all day, every day, you know." When the voice-over is done, Pacquiao adds, "Try one." <>The one-liner: "Now you know" (preferrably spoken ala Pacman) is a phrase that has legs, you now. Only time will tell if it’s as sticky as other memorable one-liners.